Here on our homepage we offer you the best available rates. You can easily book here or call our reception at +43 316 811 616 for personal advice on the room or suite that suits you best. If you plan to stay for several days or you come for a special occasion to Graz, you might find one of our packages attractive. You will be off to a good start into the day with the delicious treats at our magnificent breakfast buffet. If not included in the room rate already we charge € 16,50 per person and night. All prices are inclusive of VAT and exclusive of a € 1,50 local tax per person and night (children up to the age of 15 excluded). Children up the age of 12 stay free of charge in their parents’ room. An extra bed for children between 12 and 15 is available for € 27,- per night and for children older than 15 for € 52,- per night. This price is including our buffet breakfast. You can easily park your car at the Kastner & Öhler parking garage for € 17,50 per 24 hours. You can park there without reservation. 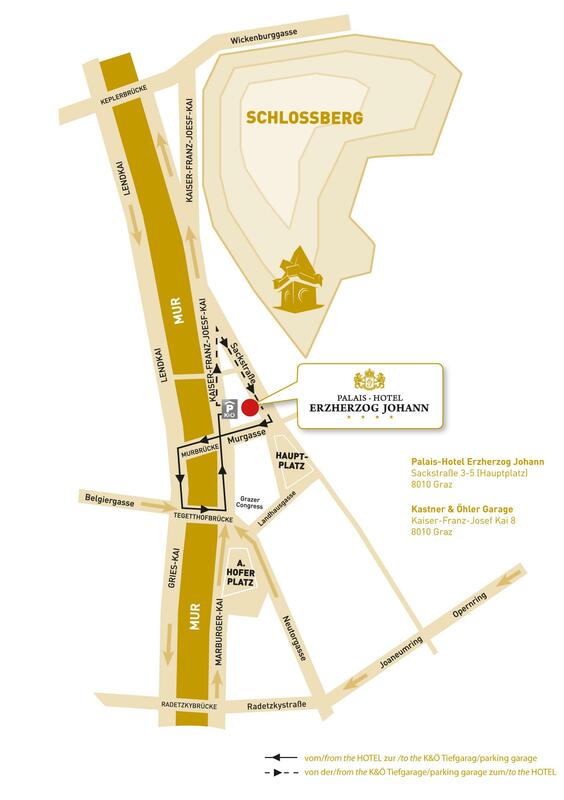 Please ask at reception for the bonus ticket before you exit the garage to get the special hotel rate. Parking in front of the hotel (at the same cost) is only possible upon prior reservation. More details of the route to hotel and garage please find here.